It was too tempting to outright call this “Pineapple-Gate,” but I love that the issue of the ridiculous nature of assessment is getting attention. The stakeholders need to be discussing this and those in power need to be listening. At issue specifically is the ridiculous testing practices that have been allowed to go on for years, collecting data that is skewed to this result or another, depending on what is chosen for inclusion or exclusion, and how we ultimately measure student learning - something that may or may not be as quantifiable as we think. Just a simple Google search for “How do we measure student learning?” offers results around measuring objectives, Bloom’s, or achievement. Not learning. How do we know for sure that learning has occurred? And how do we know specifically what a teacher’s impact is? In New York State, English Language Arts testing was last week, and even the students knew something was amiss. THE NEW YORK TIMES published an article about the testing situation with metaphorical pineapple drama (Pineapples don’t have sleeves!) and a NEW YORK CITY PRINCIPAL chimed in with her assessment of the situation. What I think is pretty cool is that the students are proficient enough to assess the assessment. What might that say about student learning? With many states upping the ante for not only more rigorous assessment and more frequent assessment, we are presenting the idea to students that learning = testing. If you don’t have to prove it, why attempt to learn it? 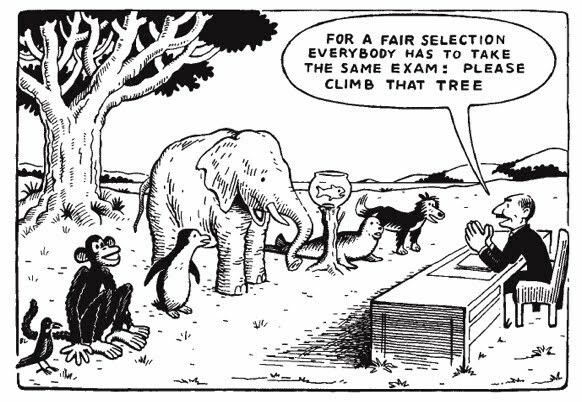 Don’t get me wrong, I’m not against standardized assessment. When I go to the doctor and he checks my cholesterol--I want that normed against what is acceptably healthy. I’m not a winner with a higher number! Likewise for blood pressure and weight. During the assessment of my health, I want there to be conversation and if a specific diagnosis is required, I want differentiated (more specific) assessments based on the information that was gathered. But we don’t treat education in the same diagnostic way. It’s one size fits all. What’s really happening is more about keeping federal Race to the Top Money than it is kids. The fact is, systemic change takes time. Is what we’re doing a brave and courageous thing with Race to the Top? Or is this just an attempt at cherry picking the best of what we think will work and piling it on top of an old system? That is never going to work. Our “application today, better tomorrow” mentality is seriously flawed, and I have a feeling that things are going to implode if we don’t address some major inconsistencies in the successes we’re planning. Implode on an Apocalyptic level. It starts today with ridiculous pineapple test questions, and tomorrow--the whole system could fall apart. the millions of dollars are going to less than well planned professional development that is frustrating schools and preventing them from systemic growth. The PD is creating a system of compliance instead. “Too much, too soon,” “dump and run,” and “drive by” are not great adjectives to describe what a lot of states are doing with their professional development. But that is how teachers and administrators feel. The money trail is leading not to children, programs, and teachers. It is leading to assessment vendors, online teacher evaluation programs, and brand new textbooks. (Textbooks which may address/reference the new standards, but hardly represent 21st Century mindsets or College and Career Readiness--many schools purchasing new textbooks would never in a million years consider a digital text.) Additionally, many of the “exemplar units” from states represent the awesomeness of 1981, not 2012. Time is not being addressed. Time for curriculum work, time for deepening instructional design and practice, and time for planning and assessment are major roadblocks not being dealt with. This will be true for administrators too as they suddenly must deal with overwhelming and cumbersome teacher evaluation plans, while being instructional leaders, running their buildings, and navigating a daily schedule of the hundreds of little decisions that have to be made on a daily basis. The assessments are not really living up to the measurement of much beyond flawed teacher evaluation systems and a misalignment of priorities around what students know and are able to do. If it were me--those students that identified some of the flaws in the recent NY state test should get honorary mastery level scores. Beyond answering those flawed pineapple questions correctly, what else says “learning has occurred” like a demonstration of the deconstruction of the validity of the test. By kids. We are not necessarily heading to a better place. We are heading toward a standoff. It’s not okay to push through so much change with the expectation of lawsuits and compliance. It’s not okay to use the variability of “one moment in time” tests to determine student achievement or teacher effectiveness. It’s not okay to call all of this innovative when we are really just bolstering the traditional. Real change means new forms and different ways of thinking. Growth should not be punitive. We are dealing with the lives and learning of children. We need to make better decisions. (I say “we” to mitigate responsibility...but I mean State and Federal Governments!) Let the people start making decisions and not the money. An Edupocalypse is imminent if we don’t start thinking forward. Leverage The Web for the Common Core! Are your students consumers of information? Collectors of information? Contributors of information? Cognitive about information? Learn how web tools can help students become content curators, collectors of information with purpose and discernment, and how these lead to supporting the Common Core. The archive of the live event is below, hosted by LiveBinders and the Knowledge Sharing Place. In this webinar, we will explore web tools, including LiveBinders, and some examples that exemplify what content curation looks like, so that your students can begin to think in new ways and extend their learning to College and Career Readiness! The companion LiveBinder CAN BE ACCESSED HERE! More on Curation and integrating 21st Century Tools can be found on Curriculum21's WEBINAR SERIES PAGE. Any of the folks that follow me regularly know that I already have a very deep love for Storybird.com. In the last few months, the company has been putting pieces into place to deepen that love a lot. A whole lot. Teachers need to pay attention here, big time! While there are a lot of free tools on the internet, there's a lot of tools that offer super mega upgrades for minimal prices. Storybird has stepped into that zone with a paid version of their product for teachers. Low cost and high return have always been friends in my book, and Storybird has created a low cost option of awesome with mega levels of return. I remember talking with the higher ups there a year or so ago about the realities of the economy and what teachers/districts could really afford to spend. They've totally hit a home run with their paid upgrade--I'm so impressed I'm blogging about it! Those of you that have been in workshops with me have likely already seen what the PDF download looks like on my iPad. I've probably also shown you the printed out books from Storybird. In this age of digital devices and anytime accessibility, the digital download is where it's at, and at 34 cents apiece, you can't beat it. Storybird's options for teachers include a plan that's roughly a hundred bucks, but gives you up to 300 PDF downloads and a slew of other options including grading, student accounts, and multiple class tools. Their service just keeps getting more and more awesome and because it's based on writing, I'm using it a lot in my work with teachers around Common Core implementations. Using the service forces some of the College and Career Readiness capacities such as attending to different audiences, tasks, purposes, and disciplines. It also demands that students be discerning in their use of the technology and offers opportunities for global conversations and interaction. Students could use it to write narrative works, persuasive and argumentative pieces and informational text, all situated with stunning visuals and an easy to use editor that most kids can master in seconds. If you're interested, here are my previous posts on Storybird. I just can't say enough good about them. I can say though that I've got to run--I'm playing on Storybird the rest of the evening!